ATLANTA – Nov. 1, 2018 – PRLog — Co-hosted by Comedian GRIFF of the Get Up! Mornings With Erica Campbell and Stellar nominated Radio Announcer Tony Gee, the 2018 Spin Awards was held at the Legacy Theatre in Tyrone, Georgia on Saturday evening. Spin Awards recipients represent some of the best and brightest in the radio industry that spin the Gospel message. Nominees from across the United States and abroad attended this sold out gala that honors Christian Gospel radio. From internet to terrestrial stations, to radio announcers, to podcasters and more were at the Spin Awards to be recognized for their contributions to Christian Gospel Radio during this historic gala. The nominees and attendees were welcomed by Tyrone, Georgia city Mayor, Mr. Eric Dial who set the tone of love and hospitality for an event that would prove to be outstanding. Apostle Veryl Howard led the attendees into the heavenlies with her “adore Him” invoking prayer and Spin Award talent like Monica Lisa Stevenson, Last Call, Group Fire, Trevone Perry, EMCEE N.I.C.E., FriiStyle, plus many more moved the crowd into worship with their music ministries. Special guest, Celebrity Hip Hop Chef, Tye Adkins and Nova, Kopp, Miss International were also on hand to help make the Spin Awards, Christian Gospel Radio’s biggest night. Another memorable moment was made when the EVERETT DRAKE DISTINCTION IN RADIO AWARD was presented by International recording artist Mr. Everett Drake, who is also a longtime iconic figure on the long running BET famed Bobby Jones Gospel Presents television show. In its 2nd year, the Spin Awards is the only national platform to strictly and solely acknowledge the gracious achievements of individuals and organizations who continue to distinguish themselves by using their broadcast platforms to spin music that honors the Lord. Christian Gospel Radio workers are also featured in the Spin Awards Magazine publication. Past winners include: Denise Hill, Praise 104.1 FM, Tina Hobson, I Am A Superwoman, Praise 108, Leo Brown, Fonye Radio & Premier Christian Radio and Christopher James, Live With Mr. “C”. Submissions for the 3rd Annual Spin Awards opens in Spring 2019. Last year the Spin Awards made history with Christian gospel music professionals and those who love gospel music attending from across the United States. This year the Spin Awards is making history happen again but with a crazy big twist. GRIFF is coming to the Spin Awards! Yes, GRIFF, co-host of nationally syndicated radio show GET UP MORNINGS with Erica Campbell and comedian GRIFF is coming to the Spin awards on October 27, 2018 at the Legacy Theater, 1175 Senoia Road, Tyrone, Georgia. The ceremony will start at 8: 00 p.m.. The Spin Awards is the first and only premiere event that strictly honors those in the Christian Gospel radio industry that spin the Gospel message. This year the event has expanded and is being dubbed the Spin Awards Weekend Experience from October 26, 2018 through October 28, 2018 in the Atlanta, Georgia area. The Pre-Show is set for October 26, 2018, 7:30 p.m. at the Crowne Hotel at 201 Aberdeen Pkwy, Peachtree City, Georgia. This exciting gala weekend will feature national gospel recording artist Everett Drake presenting the Everett Drake Distinction In Radio Award. Drake is an esteemed feature singer on the long running famed Bobby Jones Gospel Show. Other celebrities making appearances at the Spin Awards include Miss International, Nova Kopp, Celebrity Hip Hop Chef, Tye Adkins and Empire and TV One Actor, Charles D. Clark as well as performances by some of the best independent Christian Gospel artist in the world including Stellar Awards nominees, GROUP FIRE and Terrell T-Rex Simon. All of the above added up together equals this year’s Spin Awards being the place to be once again. 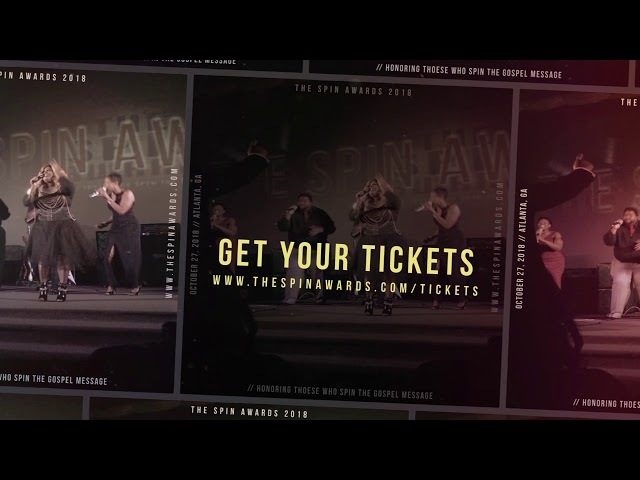 Event sponsorship questions, volunteer opportunities inquires, tickets and/or more information about the the Sin Awards compilation project, please go to https://www.thespinawards.com. Comedian, motivational speaker and veteran on-air personality, GRIFF is the co-host pf Get Up! Mornings with Erica Campbell. This author and father of five has forged his career at the intersection of faith, philanthropy and humor. With an infectious energy and an unmistakable voice, GRIFF contributes laughter, sincerity, and a real-world approach to living inspiration out loud. Follow GRIFF on Twitter at @2TRILLION. So exciting! The Original Hip Hop Chef, Tye Adkins to be a celebrity guest during the 2nd Annual Spin Awards Ceremony in the Atlanta, Georgia area on October 27, 2018 at the Legacy Theatre, 1175 Senoia Road, Tyrone, GA at 8:00 p.m.. “We look forward to seeing Tye walk the Red Carpet, a treat indeed, states Spin Awards organizers. Visit the Celebrity Hip Hop Chef here. Last year arguably, one of the highlights of the evening, the first ever EVERETT DRAKE DISTINCTION IN RADIO AWARD was presented. It was especially significant because Mr. Everett Drake, a icon in the independent gospel music community and staple on the major independent gospel industry as a longtime member of Bobby Jones Gospel Show was on hand to present the award himself. Mr. Drake will once again honor someone who spins the gospel with this extraordinary award. The wait is finally OVER!!! The nominees for the 2nd Annual Spin Awards have been announced and we couldn’t be any more excited for such a great group of Christian Gospel radio industry members! Get ready because voting starts on June 20th and will end on August 15th! To see who’s been nominated this year, visit our nominee page! Erica Campbell and Griff said WHAT?? ?